Dine Equity (DIN: NYSE) is a restaurant company that owns Applebee’s and IHOP. The stock is off about forty five percent over the last year and I’m not surprised. I’m beginning to realize that location is more important than quality when comes to casual dining. There are just too many places to choose from. People have a tendency to go with what is most convenient. Here is one example of a location strategy for restaurants. My six year old son loves IHOP so we went there recently. The place is always jammed. I’m not sure why, but it is. 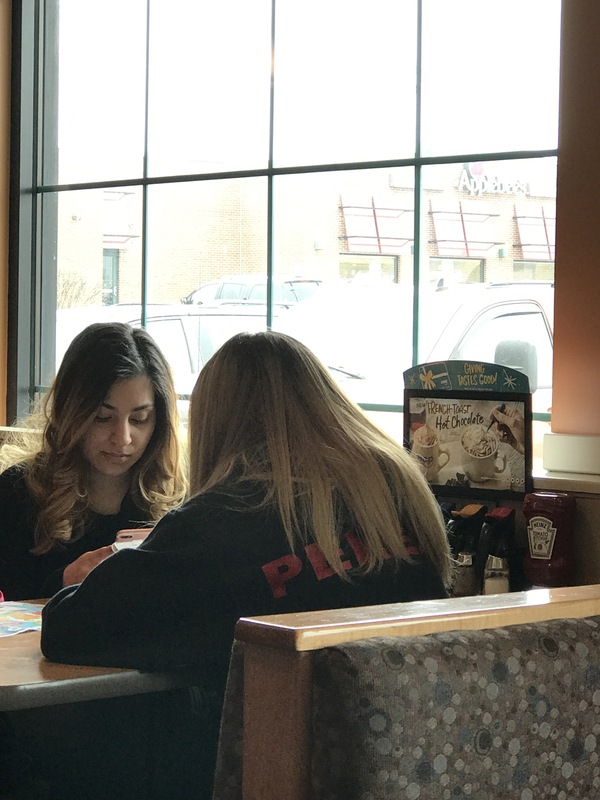 If you look through the window, you see that IHOP and Applebee’s share the same parking lot. I guess the thought is that, if you can’t get into one, you will go to the other. This is in an area where there are probably ten other options to eat within a quarter mile. I can’t help but wonder if they would be better off with a different location strategy. The stock price seems to indicate so. Then, there is Shake Shack (SHAK:NYSE) . I’ve written about them before. See here. I stopped there once and didn’t find it all that great. Definitely not worthy of the premium, in my opinion. Here’s the thing : at lunch time, there isn’t a seat to be had in the place. I know a lot of people rave about their food but I have to believe that location helps, as the Shake Shack is right in the middle of the King of Prussia mall. On your way in or out of the mall, you’re going to pass it. Couple that with the fact that it is always packed, and you have a great premium feel. Maybe it doesn’t matter what you think of the food. Zoe’s Kitchen (ZOES: NYSE) is another good example of poor location. I used to drive past their store in Wayne, PA on the way home everyday. They serve a distinct menu of Mediterranean-inspired dishes delivered with Southern hospitality, according to their website. I read recently that seventy percent of their sales comes from affluent female customers. They are in the right area for that but a lousy location caused me to notice that there was never anyone in the place when I drove by. In a high traffic, low parking area. The stock is down fifty five percent year to date. Chipotle (CMG:NYSE) I’ve only been here once but I see them with some stand alone and some other strip mall locations. They had some food safety problems, as most are aware, but then they lit themselves on fire with their public relations surrounding that. Like Shake Shack (SHAK:NYSE), the line is always out the door. High traffic location plus the “appearance” of excessive demand would seem to be a winning combination. The stock hasn’t recovered from the food safety issue, but the appetite for their food is seemingly there, despite the gastric impact.